Joan Brennecke, Keating-Crawford Professor of Chemical and Biomolecular Engineering at the University of Notre Dame, is the recipient of a $2 million U.S. Department of Energy (DOE) grant for research that could fundamentally change the way the country uses and produces energy. Brennecke received the grant from the DOE’s Office of Fossil Energy, National Energy Technology Laboratory (NETL) to study how ionic liquids, or salt in a liquid state, can improve the efficiency and economics of the carbon dioxide (CO2) capture process. Ionic liquids require less energy than today’s approaches to capturing CO2. Brennecke will study the encapsulation of solid compounds that turn into an ionic liquid when they react with CO2 and turn back into a solid when the CO2 is released. Ionic liquids, Brennecke believes, are a potentially pivotal component of an integrated system that can safely and economically sequester combustion-generated CO2, thereby mitigating its impact on climate change. The liquids have the potential to efficiently capture CO2 from the flue gas of coal-fired plants, as demonstrated in 2004 by a research team led by Brennecke and Edward J. Maginn, Dorini Family Professor of Energy Studies and department chair of chemical and biomolecular engineering, as part of a project sponsored by the DOE’s National Energy Technology Laboratory. Throughout her career, Brennecke has received numerous awards for her research, as well as for her contributions in the classroom. Most recently, she was elected as a member of the National Academy of Engineering in 2012. She has received the Ernest Orlando Lawrence Award from the DOE in 2009 and the E. V. Murphree Award from the American Chemical Society in 2014, and she also was selected as the 2008 Julius Stieglitz Lecturer Award by the American Chemical Society (ACS). 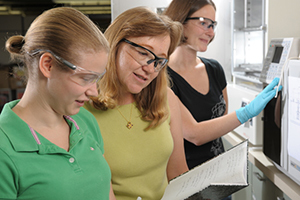 She also has received the 2007 John M. Prausnitz Award for outstanding achievement in applied chemical thermodynamics from the Conference on Properties and Phase Equilibria for Product and Process Design, the 2006 Professional Progress Award from the American Institute of Chemical Engineers (AIChE) and the 2001 Ipatieff Prize from the ACS in recognition of her high-pressure studies of the local structure of supercritical fluid solutions and the effect of this local structure on the rates of homogeneous reactions. In 1991, the National Science Foundation honored her with the Presidential Young Investigator Award. A member of AIChE, the ACS and the American Society for Engineering Education, Brennecke is past chair of the Council for Chemical Research and currently serves as editor-in-chief of the Journal of Chemical & Engineering Data. Originally published by William G. Gilroy at news.nd.edu on January 05, 2016.